Miss Chidinma Aaron, the winner of the Miss Nigeria pageant 2018. 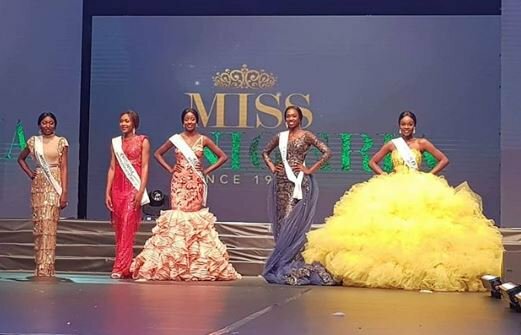 Amongst Eighteen female contestants, Chidinma Leilani Aaron has emerged the winner of the renowned Miss Nigeria pageant. The grand finale of the pageant was held on Sunday, 25th November at the Eko hotel and suites, Lagos. Five contestants were chosen from the 12, from which Ameh emerged the second runner-up while Dunu emerged the first runner-up. According to the judges, Aaron, the 42nd Miss Nigeria, will take home N3 million, a luxury apartment and an automobile. She was decorated by the 41th Miss Nigeria, Mildred Ehiguese who won the 2017 edition. In pursuant to prevent financial restraints and to make the pageant all-inclusive on the part of young ladies, the organisers of the pageant added no registration fee on the 2018 Miss Nigeria pageant.